Green=’You’re Single’, Yellow= ‘It’s Complicated’, Red=’You’re TAKEN’. The ‘Traffic Jam Pool Party’ On The 18th Of February Is Going To Be Amazing and Kamdora Is Giving Away 5 Tickets! Lagos is notorious and famous worldwide with its traffic jam. 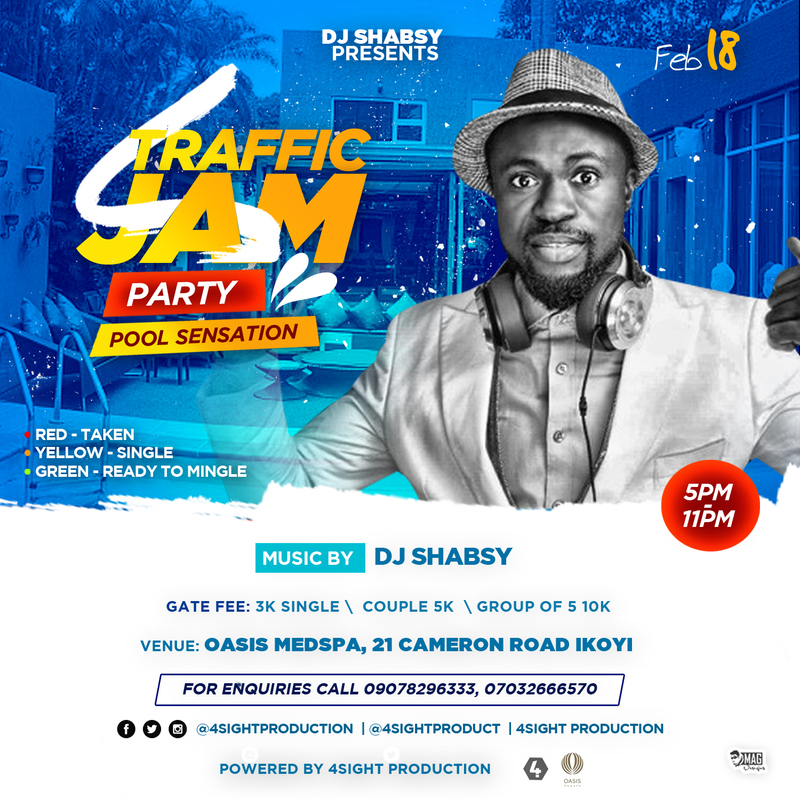 In the Spirit of Valentine, 4 Sight Production decided to organize an event called “Traffic Jam Pool Party” in partnership with Soundcity Official DJ – “Dj Shabsy”. The event which is being hosted by VJ Adams is inspired by Lagos traffic Jam. It is to take place on Saturday 18th of February, 2017 OASIS MEDSPA in Ikoyi, Lagos from 5pm – 11.30pm. Guests are required to wear traffic light wrist band colours which would be given at the gate to indicate their relationship/seeking status. RED; in a relationship and not looking. The color codes are derived from the traffic light signal colors indicating Red for Stop, yellow for Caution/Slow down, and Green for Go. This is a fun packed event you don’t want to miss. Our partners include; Kamdora, Soundcity, Obaebae, Spice TV and Igroove Radio. Table reservation call us today!!!! You’re About To See Frank Donga In His First-Ever ‘Serious’ Movie Appearance! #FromParisWithLove17 – See The Pre-wedding Images of Toyosi Ilupeju & Wole Makinwa The Lucky Couple Won A FREE Wedding For Valentine’s Day, 2017!